Dengue fever is a global acute infectious disease caused by dengue virus (DV). It is widely spread in tropical and subtropical regions. Its clinical manifestations include high fever, headache, muscle and joint pain, sometimes accompanied by rash, lymphadenopathy and leukopenia. Symptoms, when severe, can develop into dengue hemorrhagic fever (DHF) or dengue shock syndrome (DSS). Dengue fever is the most widespread and most endangered insect-borne infectious disease after malaria, and is one of the leading causes of fever in travelers travelling to tropical and subtropical regions. Currently, more than 50% of the world’s population is at risk of imported dengue infection, and about 50% live in endemic areas of dengue. The main medium for the transmission of dengue fever is Aedes aegypti, followed by Aedes albopictus. Aedes mosquitoes infected with dengue virus can pass the virus to the next generation via eggs; and the offspring of the dengue virus that has been passed through the egg can continue to be transferred to the female mosquito through mating. 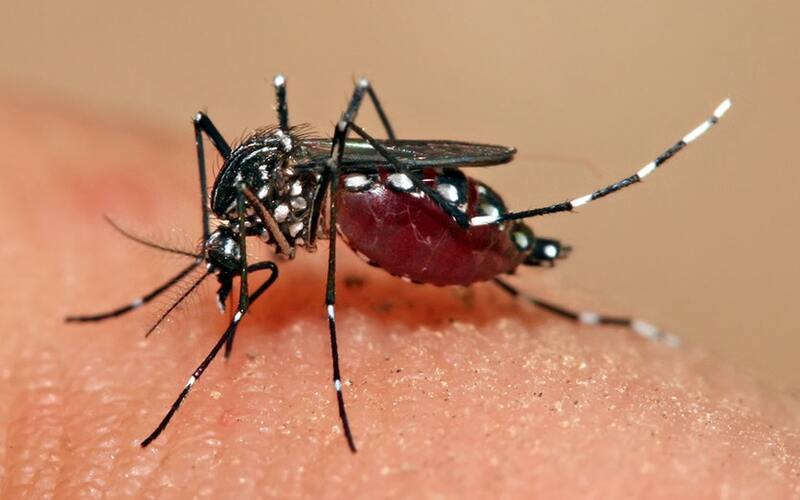 In areas where Aedes mosquitoes are active, dengue fever may be transmitted to the population after the bites of infected mosquitoes, resulting in a second-generation infection. There are four types of dengue virus (DENV), type I, type II, type III and type IV. Infection of any type will produce lifetime specific immunity to the virus, and any type of virus can cause dengue fever outbreaks. In a typical case, the patient has a fever after latent period, which lasts for 2-7 days, with muscle soreness, joint pain, anorexia, sore throat, headache, and skin rash. It is most difficult to distinguish from other febrile diseases during this period. The study found that secondary infection with dengue fever (due to the ADE effect) or infection with a lethal virus strain is a life-threatening factor. Thrombocytopenia and increased vascular permeability in severe cases can lead to complications such as bleeding and shock. Rapid case test diagnosis, timely clinical treatment, including intravenous infusion, can reduce the mortality of critically ill patients to less than 1%. So far, dengue fever has neither vaccine prevention nor specific antiviral treatment. The actual prevention of dengue fever is also in the prevention of mosquitoes. However, practice shows that the effect of prevention and control is limited. Since more than half of the cases of dengue fever are asymptomatic or only have common symptoms of fever, it is difficult to judge dengue fever only from clinical symptoms, and laboratory-assisted diagnosis is particularly important. Only by quickly and accurately diagnosing the disease as soon as possible can early reports, early isolation, early treatment, and timely killing of mosquito vectors in order to control the dengue fever epidemic. This also promotes the continuous improvement of dengue detection technology, and the detection method is simpler, faster and more accurate. For the detection of dengue virus, the main method includes antibody detection, antigen detection and nucleic acid detection. The antibody test samples are mainly blood, mainly for IgM and IgG. ELISA, ICT and DIBA are the most commonly used methods for clinical detection of dengue virus antibodies. Dengue antigen detection methods include HI, CFT, NT, immunofluorescence (IF), ELISA, and ICT, which are mainly used to detect viral proteins or viruses in samples. Nucleic acid detection is mainly based on the genetic sequence of dengue virus to design specific primers, amplification under appropriate reaction systems and conditions, and finally using instrumentation equipment to detect and judge. In addition, the use of colloidal gold immunochromatography for rapid detection of dengue virus antigens and antibodies, because of its simple operation, relatively low price, no special equipment, no special training, intuitive test results and convenient use on site, obtained extensive application and promotion.